In our institution, the fixation technique in treating idiopathic scoliosis was shifted from hybrid fixation to the all-screw method beginning in 2000. We conducted this study to assess the intermediate –term outcome of all-screw method in treating adolescent idiopathic scoliosis (AIS). Forty-nine consecutive patients were retrospectively included with minimum of 5- year follow-up (mean, 6.1; range, 5.1–7.3 years). The average age of surgery was 18.5±5.0 years. We assessed radiographic measurements at preoperative (Preop), postoperative (PO) and final follow-up (FFU) period. Curve correction rate, correction loss rate, complications, accuracy of pedicle screws and SF-36 scores were analyzed. showed inferior result in 2 variables: physical function and role physical. Follow-up more than 5 years, the authors suggest that all-screw method is an efficient and safe method. Adolescent idiopathic scoliosis (AIS), All-screw method, SF-36 questionnaire. In the past decade, pedicle screws have become the mainstream of the fixation method used to correct spinal deformities. Surgical treatment of adolescent idiopathic scoliosis (AIS) with an all-screw method has also proven to be a effective and safe procedure [1-3]. Compared with other spinal fixation devises, pedicle screws have greater correction power because of their three-column fixation [4,5]. In our experience, the use of the all-screw method achieves a superior three-dimensional curve correction rate than the two previous methods: the all-hook method and hook/screw hybrid method [6,7]. Additionally, more motion segments could be saved by reduction of the fusion length in thoracic scoliosis . posterior fusion and segmental instrumentation using either thoracic screws or lamina hooks remains contentious [7,11]. In our institution, the fixation technique in treating idiopathic scoliosis was shifted from hybrid fixation to the all-screw method beginning in 2000. We have observed an improved correction rate and minimal complications. We presume that all-screw construct could provide a good three-dimensional curve correction and maintenance. The purposes of the current study were to evaluate the intermediate-term (>5 years) effectiveness and safety profile of the all-screw fixation method in the treatment of idiopathic scoliosis. The functional outcome and quality of life was assessed by means of an established questionnaire. age at the time of the operation was 18.5±5.0 years (range, 11.7–31.4 years). The average Risser grade was 3.8±1.4 grade (range, 2–5 grade). Most patients were treated for thoracic scoliosis. According to the King classification , the patient number were King type I (n=10), King type II (n=16), King type III (n=20), King type IV (n=1) and King type V (n=2). Using the Lenke classification , the patient numbers were type 1 (n=30), type 2 (n=2), type 3 (n=8), type 5 (n=5), and type 6 (n=4). Patient data were obtained from the medical records and radiographs (Table 1). Patients were further divided in two groups, depending on the age of surgery: the adolescent (AIS) group ( ≤20 years, n=34) and the young adult (ADIS) group (> 20 years, n=15). The patient demographics in the AIS and ADIS groups were similar except the age of surgery and Risser grade (Table 1). The mean age at surgery for the ADIS patients was 25.0±3.2 years (range, 20.0 to 31.4 years) while those in the AIS patients was 15.6±1.9 years (range, 11.7 to 19.8 years)(p<0.05). The mean Risser grade for the ADIS group was 5.0 whereas for AIS group was 3.2±1.4 (p<0.05). The curve classifications was similar between two groups with thoracic curves were predominant. Pedicle screws are inserted on the concave side one by one from the lumbar up to the thoracic segments. Then the screws are inserted to the convex side, ranging in every other segment from lower to the uppermost segment. We prefer inserting 2 screws each in the lower and uppermost adjacent 2 segments. At this stage, plain X-ray films are taken both in the AP and lateral views to confirm the exact positions of the screws in most of the patients. But in some patients, these films are taken after completion of the corrective procedures. The contoured rods are linked to the rods by vertical tapping on the rods into the heads of the screws on each side. Facetectomies are also performed in each segment. Derotation is started on the concave side first after completion of connecting rod to the screws. This procedure is finished after rotating the rod to the vertical position as seen from the top. Only mild distraction of the screws is necessary. Actually, due to segmental insertion of the screws, distraction procedure is not possible. In the lower lumbar scoliotic ends, due to its convexity, compression between screws can be performed. Then the same procedure is performed on the convex side. One or 2 cross links are placed, one in the upper and the other in the lower part of the construct. With proper decortication of the laminae, the bone chips are placed on them. In our cases, we use cancellous allogenous bone graft taken from bone bank for fusion. Thoracoplasty is considered and carried out only when the rib protrusion is obvious and the angle of trunk rotation (ATR) is greater than 15°. Among the 49 cases, 42 underwent a one-stage posterior spinal fusion (PSF) and seven underwent a two-stage operation; the latter consisted of an anterior spinal fusion followed by posterior spinal fusion (APSF) with instrumentation. Four patients had additional thoracoplasty. The average number of fused spinal segments was 10.8 (range, 8–13). In this series, the screw system used included the Universal Posterior System (UPS; Aaxter, Taipei, Taiwan) for 45 cases, the Moss-Miami (DePuy Spine, Raynham, MA, USA) for 2 cases, and the Diapason (Stryker, Kalamazoo, MI, USA) system for the remaining 2 cases. The titanium-made UPS system has 6.5, 5.5 and 4.5 mm diameter screws of different lengths. The rod was 6.0 mm diameter with a smooth surface. As much as possible, mono-axial screws were used because the correction power can reach from posterior bony part to the anterior body portion . Apical trunk rotation (ATR) was presently assessed using the forward bending test at preoperative (PreOP) and final follow-up (FFU) period. The three parts of the ATR were recorded including thoracic level (TH), thoracolumbar level (TL) and lumbar level (L). The T-test was used with level of significance of 5% (p<0.05) to compare the differences between PreOP, PO and FFU data. In the coronal plane, the PreOP Cobb angle of the major curve was 58.0±13.0° (range, 40– 107), which was corrected by 72.7% to 16.0±9.0° (range, 5–51) (P<0.0001)after surgery (Table 1). The PreOP Cobb angle of the compensatory curve was 38±10° (range, 20–64), which was corrected by 72.4% to 11±8° (range, 0–26) (P<0.001) after surgery. The mean correction loss for major curve of all 49 patients at FFU was 2.4o (3.92%) (Table 2). The mean preoperative thoracic kyphosis (T4-T12) of 22±12° (range, 0–50) was reduced to 18±7° (range, 3–37) (P<0.001) after surgery and to 20±6° (range, 5–35) (P=0.12) at FFU. The mean preoperative lumbar lordosis (L1-L5) was decreased from 37±12° (range, 60–5) to 33±10°(range, 63–12) (P<0.001) after surgery, and to 37±12° (range, 63–12) (P<0.005) at FFU (Table 2). Ten out of the 49 patients had thoracic hypokyphosis preoperatively (≤10o). They achieved better kyphotic alignment after the index procedure (mean, from 6.5±3.5° to 12.8°±5.3). (P<0.005). The mean angle improved to 18.6±6.9° degrees at FFU (P<0.005). Of these 49 patients, four had thoracic hyperkyphosis (≥40). The mean preoperative thoracic kyphosis angle of 45.8±3.0° (range, 43–50) was reduced to 24.0±9.0° (range, 15–36) (P<0.001)after the operation and to 22.0±1.8° (range, 20–24) (P<0.005) at FFU. The mean preoperative ATR was reduced from 7.8±5.0° to 5.6±3.8° (TH level, P=0.28), from 8.8±5.0° to 6.3±4.1° (TL level, P=0.15), and from 8.9±5.2° to 3.1±3.5° (L level, P<0.001) at FFU. The mean Nash and Moe grade of PreOP apical vertebra rotation of 2.1±0.8 was improved to 0.7±0.8(P<0.01), but increased to 0.8±0.8 at FFU(p=0.45) (Table 3). A total of 831 pedicle screws were inserted, which included 596 thoracic and 235 lumbar screws. The mean number of pedicle screws inserted per patient was 17 (range, 10–24). Among the 831 pedicle screws, 56 (6.7%) were found to be malpositioned and most of them were situated in the thoracic spine (42/56, 75%). Furthermore, 16 screws were found inferiorly, 25 found laterally, and 15 superiorly to the pedicle. None of them were found medially. Fortunately, there were no patients who sustained a nerve root injury during surgery. There were no neurological deficits, visceral or vascular injuries after the operation and during the admission course. Also, there were no instrumentation failures or pedicle screws pull-out at the latest follow-up. One patient developed an anesthesia complication of right hemopneumothorax after central venous line insertion. The hemopneumothorax resolved uneventfully after chest tube insertion. Although some controversy does exist, the all- screw construct has gained worldwide popularity in treating idiopathic scoliosis in the last decade. This reflects the majority consensus that the all pedicle screw approach can achieve better three-dimensional correction and less correction loss compared to the all-hook and hybrid construct approaches. A direct comparison between the hybrid and all-screw construct revealed superior major curve correction in all-screw group (70% versus 56%) in 58 AIS patients . This is consistent with a previous study using the Moss-Miami hybrid construct in 61 AIS patients, which revealed a 56% correction rate of the major thoracic curve . In the present study, a correction rate of 72.7% was achieved on the coronal plane with a flexibility of 41.8% (Figure 2). This correction rate echoes those of other studies on segmental pedicle screw fixation of idiopathic scoliosis [1,3,7]. Correction loss of the major curve with various types of instrumentation has been given great attention in the literature. Improvements in the fixation instruments used in scoliosis surgery have improved the correction loss rate. In one study, for example, the use of CD instruments in 64 patients produced an average correction loss for King type 2 and 3 curves of 5.2o (11.6%) and 3.9o (8.3%), respectively . The use of pedicle screws, which can provide better holding power, can substantially improve the correction loss rate from 3–6% [3,7]. In this series with minimum 5 year follow-up, the correction loss averaged 2.4o (3.9%). Compared to our own previous reports with 7.8% correction loss rate for all-hook and 6.6% for hybrid construct , we presently obtained a better result. Also, this compares favorably with other intermediate-term studies using segmental screw instrumentation . The results of long-term follow-up of Harrington rod instrumentation for correction of idiopathic scoliosis highlights the importance of preserving or restoring sagittal alignment of the spine PO. Numerous reports have pointed out the complications of significant loss of lumbar lordosis, which results in “flat-back syndrome” . In this study, the thoracic kyphosis and lumbar lordosis were well-maintained PO and at the latest follow-up. In addition, the thoracic hypokyphosis and hyperkyphosis in our 14 patients improved to a better kyphotic angle. The same effect has been reported in a screw group with good correction of preoperative hypokyphosis (from 9o to 27o) , which was comparable to the hook or hybrid groups. In another study, the PreOP hyperkyphotic status in 26 patients was reduced in the screw group . Safety on insertion of thoracic pedicle screws is always a great concern , especially at the concave upper thoracic segment with the deformed and small caliber pedicles. Although the incidence is rare, the complications of thoracic screw misplacement can be obvious and fatal. Reported complication rates associated with pedicle screw placement range from 0–25% , in which the malposition of the screw is the most common problem. In addition, major complications such as neurologic or vascular injury are exceptionally rare. In our series, the screw misplacement rate was 6.7%. Also, there were no major or fatal complications. Therefore, we consider that placement of thoracic pedicle screws using free hand technique is a safe and reliable technique. But, the technique requires experienced personal with better tactile feedback skills and a thorough understanding of the deformed spine anatomy. The technique additionally benefits from the more user-friendly instrumentation tools developed in recent years. These included a smaller pedicle finder (2 mm) and various choices of pedicle screws for upper thoracic segments (25 mm, 30 mm, and 35 mm long). While we did not use the navigation system for pedicle screw placement, we think this modern modality could be helpful for deformity operations. Short form-36 (SF-36) and Scoliosis Research Society (SRS) Outcomes Instrument (SRS-22) are both well-validated questionnaires of “quality of life” assessment[22,23]. Although a Chinese adaptation of the SRS-22 has been previously validated in Hong Kong, no validation exists for use in Taiwan. SF-36, on the other hand, has been validated and used in Taiwan since 1996 (Taiwan version 1.0) . The SF-36 health status questionnaire is a patient elfperceived tool and has been documented in several studies when assessing functional status of scoliosis patients [22,23]. Physical and mental status is also very crucial for these young patients, who are usually students or young employees with many physical and social activities. In the present study, there were two significantly lower scores compared to agematched Taiwanese including physical function (PF), and role physical (RP). It is notable that both variables belonged to the physical health category. This indicates that, even with similar mental health compared with healthy populations, such patients subjectively demonstrate inferior physical status and role limitation. This is consistent with a Norway study with 30 AIS patients . Limitations of this study include relatively small sample sizes and no omparative groups. We also did not use CT scan to assess the accuracy of screw placement. However, this study demonstrates the early experience and clinical results of using all-screw method by a single surgeon in a single institution. Based upon the results obtained from this review of 49 AIS patients with minimum 5 years of follow-up, we suggest that the all-screw method is efficient and safe. The outcomes in threedimensional correction are satisfactory and comparable. The curve maintenance is good with minimal loss of correction. Compared with age-matched healthy populations, these patients did present some limitations on their physical health, as assessed by the SF- 36 questionnaire. NSC-2622 B 002–002 (PQC) and the Taiwan Spine Research Foundation. Suk SI, Lee SM, Chung ER, Kim JH, Kim SS: Selective thoracic fusion with segmental pedicle screw fixation in the treatment of thoracic idiopathic scoliosis: more than 5-year follow-up. Spine 2005, 30(14):1602–1609. Suk SI, Kim WJ, Lee SM, Kim JH, Chung ER: Thoracic pedicle screw fixation in spinal deformities: are they really safe? Spine 2001, 26(18):2049–2057. Lehman RA Jr, Lenke LG, Keeler KA, Kim YJ, Buchowski JM, Cheh G, Kuhns CA, Bridwell KH:Operative treatment of adolescent idiopathic scoliosis with posterior pedicle screw-only constructs: minimum three-year follow-up of one hundred fourteen cases. Spine2008, 33(14):1598–1604. Lehman RA Jr, Polly DW Jr, Kuklo TR, Cunningham B, Kirk KL, Belmont PJ Jr: Straight-forward versus anatomic trajectory technique of thoracic pedicle screw fixation: a biomechanical analysis. Spine 2003, 28(18):2058–2065. Lehman RA Jr, Kuklo TR: Use of the anatomic trajectory for thoracic pedicle screw salvage after failure/violation using the straight-forward technique: a biomechanical analysis. Spine 2003, 28(18):2072–2077. Suk SI, Lee CK, Kim WJ, Chung YJ, Park YB: Segmental pedicle screw fixation in the treatment of thoracic idiopathic scoliosis. Spine 1995, 20(12):1399–1405. 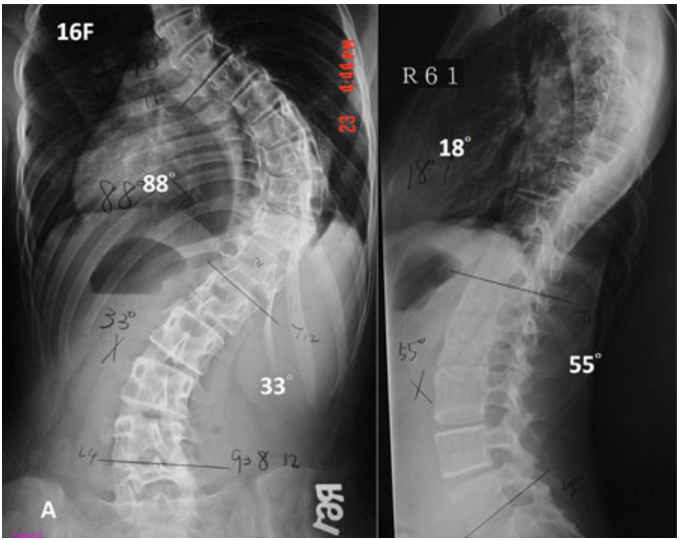 Kim YJ, Lenke LG, Kim J, Bridwell KH, Cho SK, Cheh G, Sides B: Comparative analysis of pedicle screw versus hybrid instrumentation in posterior spinal fusion of adolescent idiopathic scoliosis. Spine 2006, 31(3):291–298. Smorgick Y, Millgram MA, Anekstein Y, Floman Y, Mirovsky Y: Accuracy and safety of thoracic pedicle screw placement in spinal deformities. J Spinal Disord Tech 2005,18(6):522–526. Papin P, Arlet V, Marchesi D, Rosenblatt B, Aebi M: Unusual presentation of spinal cord compression related to misplaced pedicle screws in thoracic scoliosis. Eur Spine J1999, 8(2):156–159. Di Silvestre M, Parisini P, Lolli F, Bakaloudis G: Complications of thoracic pedicle screws in scoliosis treatment. Spine 2007, 32(15):1655–1661. Jansen RC, van Rhijn LW, Duinkerke E, van Ooij A: Predictability of the spontaneous lumbar curve correction after selective thoracic fusion in idiopathic scoliosis. Eur Spine J 2007, 16(9):1335–1342. King HA, Moe JH, Bradford DS, Winter RB: The selection of fusion levels in thoracic idiopathic scoliosis. J Bone Joint Surg Br 1983, 65(9):1302–1313. Lenke LG, Betz RR, Harms J, Bridwell KH, Clements DH, Lowe TG, Blanke K: Adolescent idiopathic scoliosis: a new classification to determine extent of spinal arthrodesis. J Bone Joint Surg Br 2001, 83-A(8):1169–1181. Lonner BS, Auerbach JD, Boachie-Adjei O, Shah SA, Hosogane N, Newton PO: Treatment of thoracic scoliosis: are monoaxial thoracic pedicle screws the best form of fixation for correction? Spine 2009, 34(8):845–851. Nash CL Jr, Moe JH: A study of vertebral rotation. J Bone Joint Surg Br 1969, 51(2):223–229. 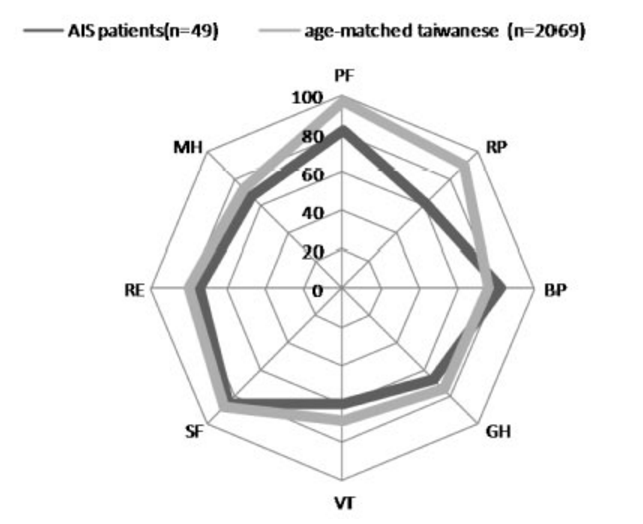 Lu J-FR, Tseng H-M, Tsai Y-J: Assessment of Health-related Quality of Life in Taiwan (I): Development and Psychometric Testing of SF-36 Taiwan Version. Taiwan Journal of Public Health 2003, 22–6:501–511. Chen PQ: Management of scoliosis. J Formos Med Assoc 2003, 102(11):751–761. Puno RM, Grossfeld SL, Johnson JR, Holt RT: Cotrel-Dubousset instrumentation in idiopathic scoliosis. Spine 1992, 17(8 Suppl):S258–S262. 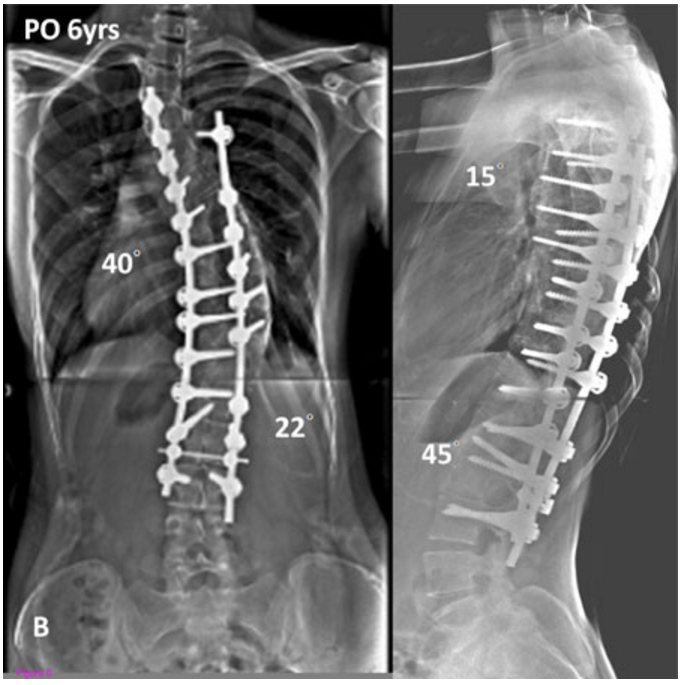 Chen PQ, Yang SH: Surgical Correction of Adolescent Idiopathic Scliosis: A 5 to 12 years follow-up study of thoracic type adolescent idiopahtic scoliosis undergoing Cotrel- Dubusset instrumentation. Journal of Bone and Joint Surgery – British Volume 2002, 84- B(SUPP_III):239. Lagrone MO, Bradford DS, Moe JH, Lonstein JE, Winter RB, Ogilvie JW: Treatment of symptomatic flatback after spinal fusion. J Bone Joint Surg Br 1988, 70(4):569–580. Kim YJ, Lenke LG, Cho SK, Bridwell KH, Sides B, Blanke K: Comparative analysis of pedicle screw versus hook instrumentation in posterior spinal fusion of adolescent idiopathic scoliosis. Spine 2004, 29(18):2040–2048. Lai SM, Asher M, Burton D: Estimating SRS-22 quality of life easures with SF-36: application in idiopathic scoliosis. Spine 2006, 31(4):473–478. Schwab F, Dubey A, Pagala M, Gamez L, Farcy JP: Adult scoliosis: a health assessment analysis by SF-36. Spine 2003, 28(6):602–606. Lee Y-H, Yang N-P, Wei K-Y, Chou P: Comparison of quality of life between subjects with traumatic wrist and hip fractures. Changhua J Med 2005, 10:51–58. Kibsgard T, Brox JI, Reikeras O: Physical and mental health in young adults operated on for idiopathic scoliosis. J Orthop Sci 2004, 9(4):360–363.